Roger Family Sailing Adventures: Leaving the Bahamas? We left for Conception Island after a mad dash to the airport in George Town to pick up a replacement part which is at the core of our boat wifi system. The $80 cost for the part was small after the $22 shipping costs, $40 ride out to the airport, the $30 brokerage fees and the $35 duties. BUT, we have internet! Our buddy boats left George Town earlier in the morning but by 10am we had cleared Elizabeth Harbour and were on our way to Conception. There was no wind and we motored the whole 30 nm. Along the way another boat hailed us on the radio to check out the pilot whales that were floating on the surface like black rubber inner tubes. Sure enough, as we came closer we could make out some detail before they slowly slipped under the water. As soon as we passed they rose back to the surface. We rounded the point of Long Island and were able to spot the Columbus Monument that we visited last year. Conception – where some believe Columbus first landed - is only 15 nm further on and so it was less than 3 hours before we spotted the 10 other boats in the harbour. The next day we took the dinghy to explore the mangrove creeks in the island. The island is part of the Bahamas Trust and so critters are protected. 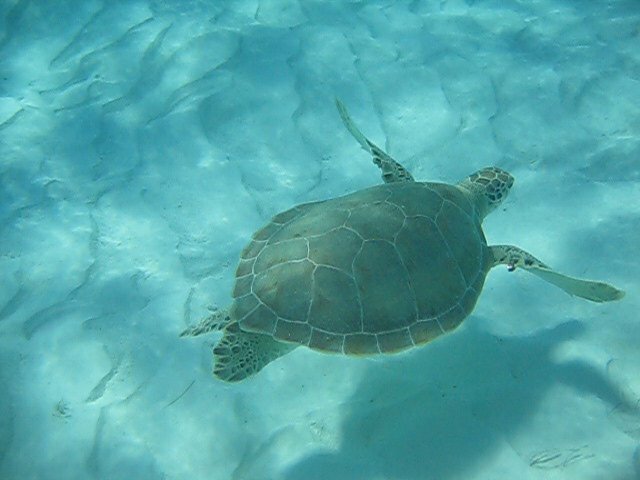 We saw lots of turtles but didn’t see any of the sharks that fellow cruisers have reported. The reefs around the island are full of life and we saw lots of folks out there with spears looking for fish and lobster. We aren’t clear on whether the seas around the island are protected or just the inland parts but the hunter-gatherers from other boats were comfortable collecting their bounty. After two days we were warned of a huge cold front and so we ran to Rum Cay to hide from the 20 to 30 knot winds. Caught another mahi on the way over. We’ve become a little trapped here. The winds don’t seem to be changing to any large degree and so it appears that we will have to motor directly into big wind and seas for a couple of days to get to our next stop – the Turks and Caicos. In the meantime, we’ve explored the island, got to know some of the other cruisers and their plans and contributed to the restaurant and bar businesses on the island. “Kaye’s” is run by her daughter Delores. Delores wrote a book – “Rum Cay, My Home” which is a prescribed text in the Bahamas public education system. When you want a beer in her place, you go behind the bar to get it, find the opener and make your own change from her cash box. Her place reminded us a lot of Miss Pearl’s place in Great Inagua and we mentioned that to her. She knew Miss Pearl so it was cool to be able to tell her that our boats – Miss Pearl and Blue Pearl are named after her. We are hoping to leave early Thursday morning for a 190 nm run to the Turks. That will take us for our first overnight run. Glen has plenty of experience driving and sleeping at the same time so this should be a natural for him.